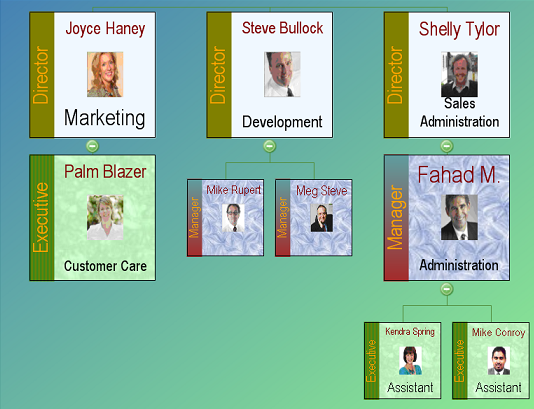 Welcome to industry's most comprehensive and easy-configurable organization/hierarchy/tree chart control from Unifosys, that allows .NET developers to quickly build organization chart enabled applications and web pages. 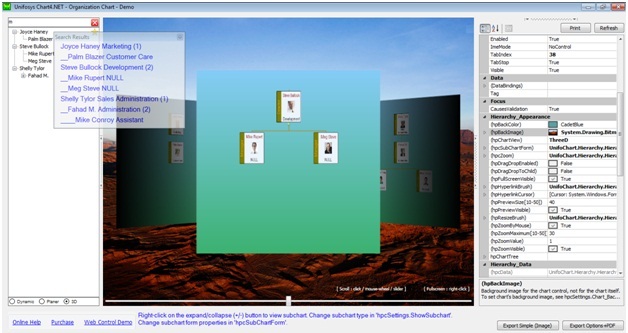 It is also useful to create hierarchy-chart based GUI applications. Hierarchy charts with unlimited nodes and levels can be easily created and navigated using automatic subcharts. It is Dynamic (data). It is Automatic (drawing). Hierarchy is the organizational relationship of items within a group. Groups can be that of people, components of any type of objects, networks or activities. Actually everything is hierarchical. Hierarchy charts provide a quick overview of the groups and items together with its details and photos. What is a hierarchy chart? Hierarchy chart is a pictorial representation of hierarchy. 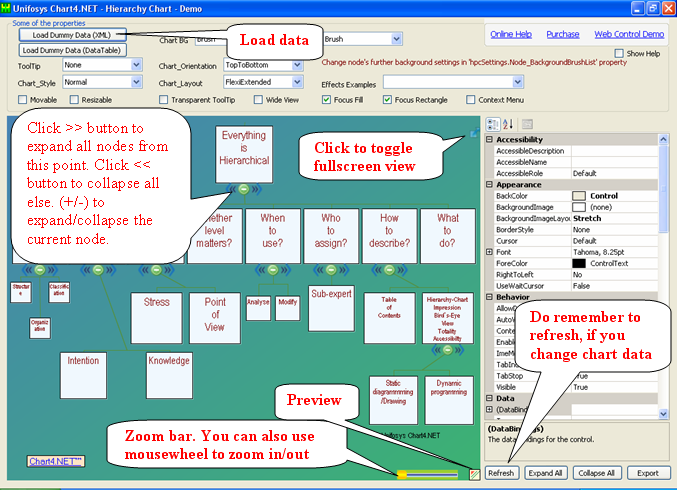 Chart4.NET provides advanced formatting and easy configuration options to create highly effective organization charts. 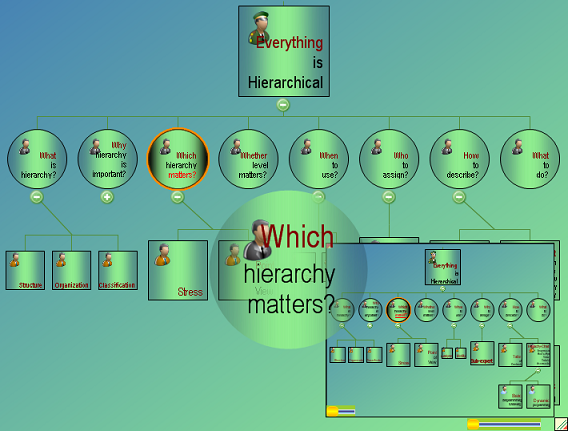 Hierarchy charts can dynamically obtain data from a wide variety of data sources including database, XML, treeview etc. So it is really simple to get started, and to experiment the customizations. Download the free hierarchy-chart designer sample project (no setup required) to experiment with chart control features. Default brushes, fonts, layouts etc. are set for the control. If you want, you can change anything of them. There is separate bruhes (color+style/gradient) and fonts for title, text and tag. And there is a lot of optional features which can be enabled or disabled (zoom, preview, subcharts etc.). Please see the screenshots. Quickly turn TreeView or TreeNodeCollection into Hierarchy Chart. Automatic node positioning with layout options. Expand, Collapse, CollapseLeft, and ExpandRight of nodes. Multiple datatables and linking of tables. Runtime resizable and movable charts for Winform and Webform. Zoom (Mousewheel and slider for Winform and Webform) and Preview. 3D chart and shaded charts. Import from XML, any database/DBMS, CSV file, datatable or array. A lot of customization options for chart and nodes. For feature details and mapping, please see the description below. .NET Framework 2.0 and later. Visual Studio 2005 and later. Offline documentation in Compiled Help Manual (.chm) format is available with license. Support is available with license.